Do you need an easy dinner idea for busy weeknights? 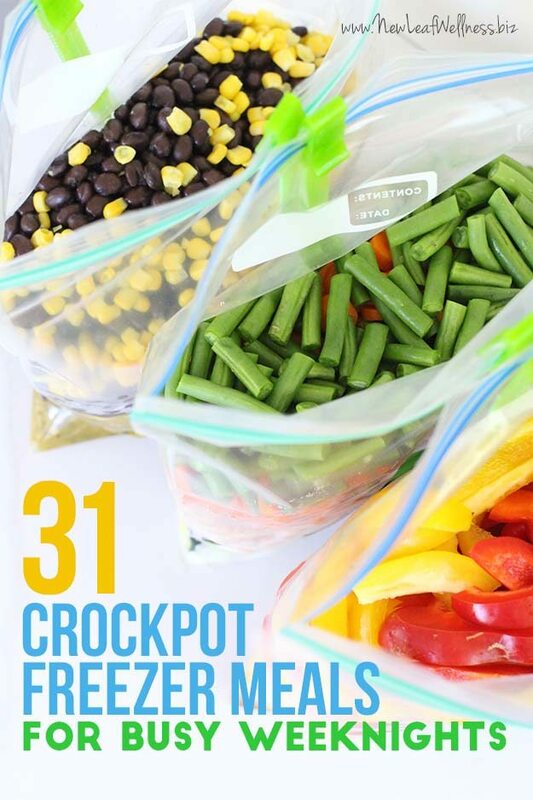 Stock your freezer with crockpot freezer meals! Here are 31 delicious crockpot recipes that I’ve tried myself (grocery list included!). I have three young children (and a fourth on the way) so I don’t have a lot of time to cook. Instead of scrambling in the kitchen every night, I spend an hour prepping crockpot freezer meals over the weekend and that’s all the cooking that I need to do for the week. They don’t require any cooking ahead of time, so they’re very quick and easy to prep. You can save a lot of money by prepping a bunch of meals at once. 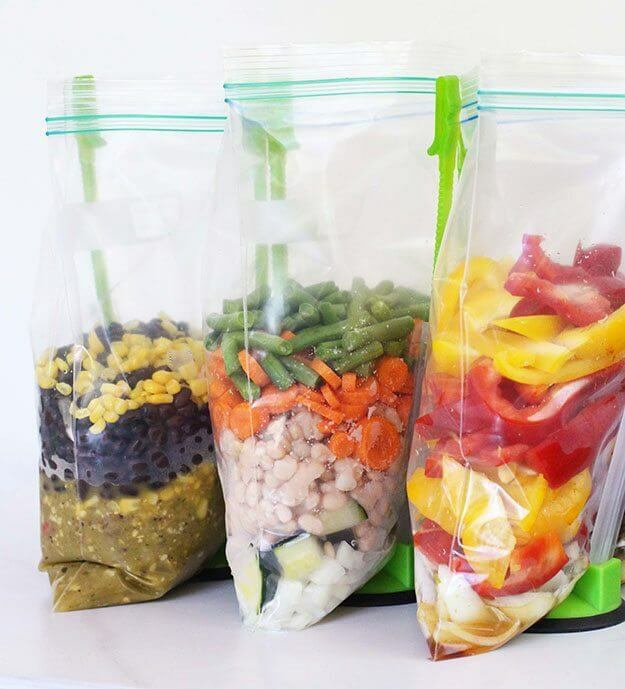 When I’m prepping freezer meals, I combine the ingredients in plastic baggies, remove as much air as possible, and freeze for up to three months. I’ve made hundreds of crockpot freezer meals this way and they’re all healthy, delicious, and easy to make. Since this is such a hectic time of year, I decided to compile of list of my 31 favorites that are perfect for busy weeknights. If you’re nervous about mixing raw meat and vegetables, don’t be. I did a lot of research when I was writing my No Cook Freezer Meals cookbook and, according to the USDA Food Safety and Inspection Service, freezing to 0 °F inactivates any microbes present in food (such as bacteria, yeasts, and molds). That means freezing raw meat with vegetables, sauces, and spices is perfectly safe. If you’re hesitant to freeze so many new recipes at once, I recommend trying a couple for dinner this week. Once you see how delicious they are you’ll want to stock your freezer ASAP. Enjoy! For those nights that are busy, it’ll be so nice to have each of these delicious meals on hand! A lot of these recipes are from freezer prep sessions that I’ve done this year so I typed up exactly how I prep and freeze each meal in this printable pdf: 31 CROCKPOT FREEZER MEALS – RECIPES & GROCERY LIST. I also included a super detailed grocery list in case you want to prep all of them at once. I tried the three-ingredient chicken teriyaki with the frozen stir fry vegetables. It was good but after six hours in the crockpot, the veggies were mush. At the time, I couldn’t imagine the vegetables being edible after six hours. I was close to right. They didn’t taste bad, just no texture. Should I adjust any recipe calling for frozen vegetables to wait to add them until about the last 1/2 hour? I am out of the house more than 6-8 hours so I am afraid my meal would be dry and overcooked if I followed the timing exactly. What if I didn’t thaw my bag first? Not sure how easy it would be to get all the frozen items into the crock pot, but if the meat is frozen it would take longer to cook, right? What are your thoughts on this? You’ll need to thaw them at least enough to break apart the frozen square block. I would consider using a basic light timer to turn off the crockpot an hour before you get home (any longer than that and the meal will be cold) OR buying a crockpot with a programmable timer. I bought one for about $40 and I’m obsessed with it. Yes, as long as the food will fit in a bag/crockpot. What a wonderful resource! I’ve wanted to do make ahead freezer meals for decades and just haven’t done it. Now, we are down to two of us, Any suggestions on how do do it for 2 people? You made me buy a slow cooker! But when I read the instructions, they say you should never put something frozen in the pot (mine is a Kitchenaid Architect)… How do you deal with frosen stuff in your slow cooker? I really want to make those time-saving meals! I wondered that, too. When reading the instructions for the recipes it states to move the frozen bag to the refrigerator the night before to thaw, then place in the slow cooker in the morning. Hope that helps! You are right and I should have read a little more! Moving the bag to the refrigerator the night before seems like the way to go! Thanks! make sure to bookmark yor blog and will come back in the future. Hi Kelly! Where do get 16 oz. bags of frozen veggies? All I can find are 12 oz, 24 oz, and 32 oz. Thanks! These are wonderful! Thank you; I just started working nights and was looking for slow cooker meals. Prepping ahead of time is a great idea. What are the three freezer meals in the photos? I’m very limited on the selection of food I can get due to difficult financial restraints, can I substitute things like hamburger and chicken for pork chops and roast? Yes, definitely. Just watch the cooking time because chicken is easy to over-cook and dry out. I bought your cook books earlier this year and they are a life saver! My husband does not like vegetables, but I just made the Chicken Chile and he used just the chicken and loved the flavor and I got my vegetables! Win/Win. Thanks for these additional recipes! I’m so glad, Christine. Yay! I’ve made similar/identical recipes as some of these but there were quite a few new ones I look forward to trying out. :) I noticed on some of them, it seems that the ground beef should be browned ahead but wasn’t mentioned on the PDF instructions. With #1, I actually followed the link to the original post and found those instructions include browning the meat. I’ve also made the Enchilada stack before from “a year of slow cooking” which is essentially the same recipe and it has you brown the meat ahead which I imagine helps it keep the stack shape and avoid the tortillas from getting too soggy. I am very interested in this. Do you have a cookbook in the stores? No, at this time I only have pdf eBooks. They are formatted to print on regular 8.5×11″ paper though. I love these ideas and will most likely try this my next grocery trip. I know you said you have 3 small kids. So I’m guessing it feeds everyone. my family is 2 small kids, myself, husband, and another adult. do you usually have leftovers? The average size is 4-6 servings. I listed the number of servings with each recipe in the printable doc. Hope that helps! Can’t wait to try these! Do you have labels to go with these I can print out? Thank you. I want to make honey Dijon pork and green beans. I am on a low carb diet. Could I use honey mustard salad dressing instead of honey? I think so, but I’m not sure if it will taste as good. Have you tried freezing with uncooked, dried beans rather than cooked or canned? If you want to use dry beans, I would soak them ahead of time and add a bit of extra liquid to the recipe. I typically use canned so I don’t have to spend time soaking. Sometimes I soak and cook dried beans and freeze them though. Then they’re ready to add to my crockpot recipes or freezer meals whenever I need them. I am definitely going to try a lot of these! There are a couple of recipes that say to cook on low for about 4-6 hours. I work 8 hour days and by the time I get home some nights it is more like 9. How would I adapt those so I don’t have a bunch of mushy food when we get home? Chicken recipes are tricky because they’re so easy to dry out. If you have to be out of the house for 9 hours and want to make one of those recipes I would either use a smaller slow cooker (4 quarts max) or consider buying one with a timer. I bought one earlier this year and it’s a life-saver! I’m not sure that is safe. My pot has a timer I can set it for 6 hours but that would leave it setting there 3 hours after its cooked. Yes, that is totally fine. I do it all the time. Mine has the timer and then a keep warm setting. haven’t had any trouble. That’s a great question and one that’s crossed my mind. Will be watching for a response.